Bordeaux, “Famous Wine Villages of Bordeaux” series , collection, available including for exhibition. By Gordon Frickers, a marine painting measuring 47 x 62 cms (18,5″ x 24,5″), oils, available. This painting is quite an ‘after dinner’ subject; it came into being following an enquiry from a gallery in Saint Emilion. 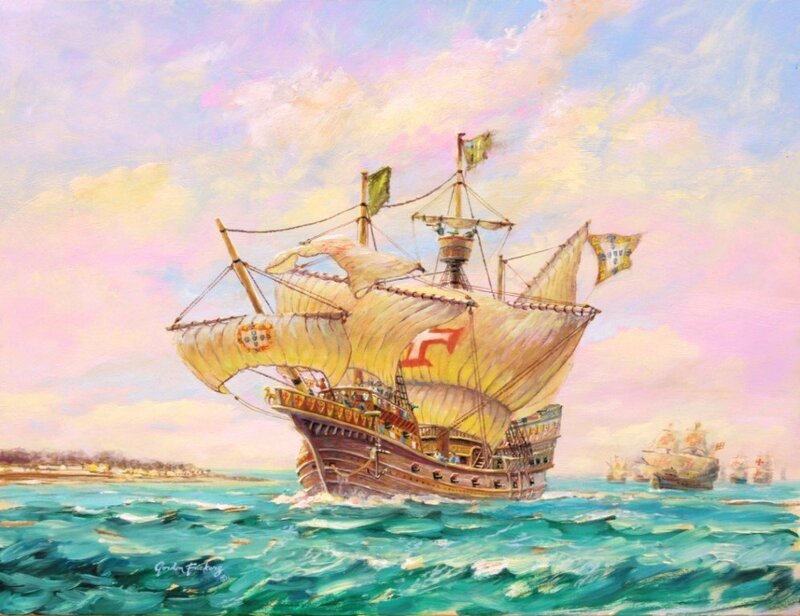 Their client wanted a painting of medieval ships on the Gironde. Although I had no painting in stock I liked the idea, know well the approaches to Bordeaux. 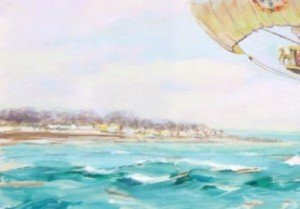 There followed a period of though research to ensure each detail is historically correct and the actions you see the crew performing are all appropriate thus we have a colourful scene that is an historical document, a lively sunny study. Our prospect was history by then however the painting was subsequently chosen by Bloomsbury for a book cover which just leaves this beautiful original needing a good home. The book cover “The Coming of the Cross” will be illustrated by this painting. Following the success of “The Corsair”, now a best seller in Arabic and English (ISBN 978-99921-94-72-0) the publishers have asked to use the same artist for the whole series. The cross in various forms was a normal emblem on European ships for many centuries helping identify friend and foe, Christian from Muslim. The arrival of Portuguese ships in the Arabian sea had a profound influence upon the region. Muslims soon discovered at great cost their men and ships were no match for the sturdy castellated Portuguese vessels which simple shot them to pieces. One of the many effects was Arab ship construction gradually began to copy European designs. Bordeaux is the only wine region in France not redeveloped by ‘The Church’ after the dark ages. 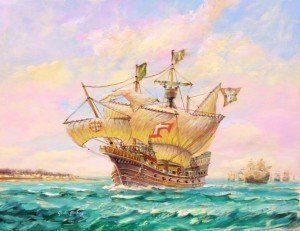 The Bordeaux wines story is inexorably bound to the sea, as these 15 th century Portuguese Carracks imply. Bordeaux wines have been and still are shipped to every European port, probably every European city, more recently to the USA, most of the American founding fathers wrote about Bordeaux wines which today are increasingly popular world wide.